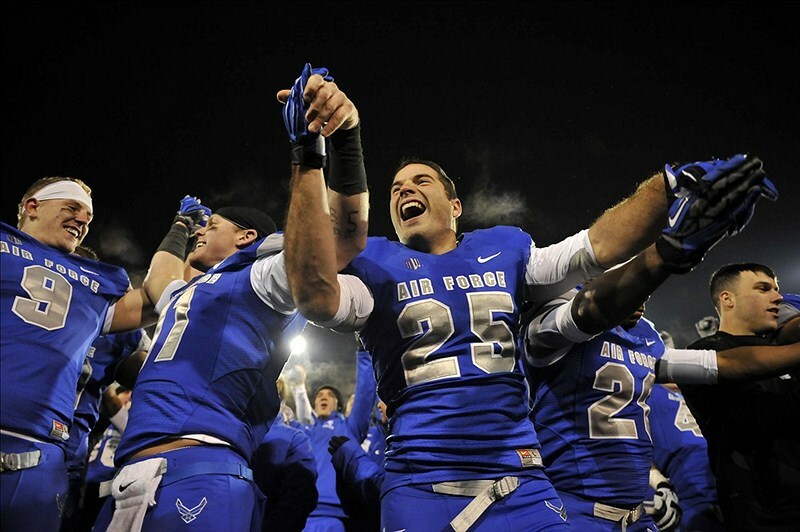 You are at:Home»Air Force»Bowl update: Who might Mids, Falcons face in postseason? With wins last weekend, both the Navy Midshipmen and the Air Force Falcons improved to 5-3 on the season, one win away from bowl eligibility. Navy has no teams above .500 remaining on its schedule and hosts 2-6 Florida Atlantic this Saturday; Air Force visits 1-6 Army on Saturday and has a date with Hawaii (1-6) in Colorado Springs on Nov. 16. Coaches and players can’t take wins for granted, but bowl projections have to. And if some of the most well-known postseason guessers — CBSSports.com’s Jerry Palm, college football wizard Phil Steele and ESPN projectors Mark Schlabach and Brad Edwards — are right, the Mids and Falcons will face off on the same day in December against opponents to be determined. And there’s lots of determining to do: None of the experts agree on who Navy or Air Force might face. Navy: There’s little mystery about where the Mids will play if they reach the six-win mark — Navy’s locked into a trip to San Francisco for the Kraft Fight Hunger Bowl on Dec. 29. The mystery comes with the opponent. The Mids are set to face a team from the Pac-12, with Kraft bowl organizers selecting sixth among bowls with tie-ins to the conference. Palm figures the Mids will face Arizona, now ranked 22nd in the Bowl Championship Series standings. Steele says Arizona State will get the berth. Schlabach says UCLA, while Edwards picks 4-4 Washington, teetering on the edge of eligibility. Four experts with four separate teams. And it could get more confusing if Pac-12 leader Oregon gets knocked off, sending the Ducks out of the BCS title game projection and into the Rose Bowl … and possibly adding another Pac-12 school to the mix. Air Force: The Mountain West Conference has deals with five bowls, and the one Air Force played in last year isn’t on the list. While it’s possible the Falcons could be shuffled out of the traditional MWC lineup again, all four bowl projectors see Air Force touching down in Fort Worth, Texas, on Dec. 29 for the Bell Helicopter Armed Forces Bowl. That’s where the agreement stops. The bowl has a deal with Conference USA to fill its other spot. Of C-USA’s 12 teams, only five are at or above .500. According to the experts, four of those are potential Falcons opponents: Steele says Air Force will draw Southern Methodist, Palm picks recent Navy victim East Carolina, Schlabach goes with Central Florida and Edwards selects Tulsa. Expect both lists of opponents to shuffle throughout November as bowls jockey for the best matchups, teams slip below .500 and BCS title-game moves trickle down through the rest of the complicated bowl system. If Boise wins out they will likley go to a BCS bowl (assuming they are ranked ahead of the Big 10 or Big East Champion and finish in the 16). If AF also wins out (I peg the chances of this at 25%) will the Las Vegas Bowl be required to select AF (as the highest finisher in conference, sans BSU)? Or wil the Las Vegas Bowl get to select the MWC representative from among all MWC eligible teams? If the latter, do you know the chances of them selecting AF? With AF having gone to the Armed Forces Bowl three of the past five years, I’d favor a different bowl for AF (such as the Las Vegas or New Mexico Bowl, both of which would be against PAC-12 teams). I’d appreciate any insights you have.